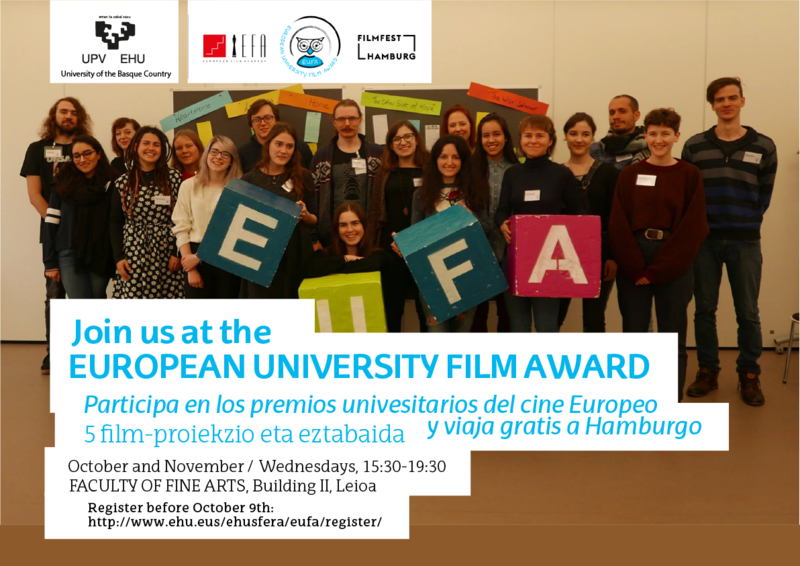 The University of the Basque Country UPV/EHU is one of the European universities participating in the European University Film Award (EUFA), an initiative of Filmfest Hamburg and the European Film Academy (EFA), presented and voted by European university students (visit their web-site: http://www.eufa.org/ or their facebook page). The course will consist of 5 sessions, where we will watch the selected films and discuss them. The goal of the course, among others, is that our students improve their skills when talking about cinema in English, so debates and presentations will take place in this language (students with a low level of English can attend as well, but are not elibible to travel to Hamburg as representatives). This event is available for EHU students only (not open to the general public). Film screenings and debates: October 17, 24, 31 and November 7 and 21. – Trip to Hamburg (only for 1 student elected as representative): December 4-7, 2018. (Please, note that to be eligible as a representative to travel to Hamburg you must attend all sessions). Leioa (Faculty of Fine Arts, Building II, screening room). The EUFA free-choice course (1 ECTS credit) at University of the Basque Country takes place during the first semester, and consists of a series of screenings, master classes, workshops and debates to discuss European films nominated by the European Film Academy. One student from our university will travel to Hamburg for a two-day deliberation meeting in December. During those two days the students coming from universities of different European countries will watch all films together, exchange arguments and will vote for the final winner. The 1st European University Film Award went to I, DANIEL BLAKE! (Ken Loach) and the 2nd to HEARTSTONE (HJARTASTEINN) (by Guðmundur Arnar Guðmundsson. Iceland/Denmark 2016. Fiction).